After the 9/11 incident, Muslim people around the world was despised and feared. In addition, they were subjected as all are terrorists. Vanished from America, this peaceful community of Muslim people was detested away. They were living there serenely but their own brothers created the stain that could never be erased. From what they did, they contradict with the teachings of the Qur’an. They were not Muslim anymore but a group of wicked and selfish men. Al Qaeda is a bad dream for all people who only want liberty and fairness. Islam is not only a religion but an absolute way of life. It encourages peacefulness and equality. It is all about goodness to your neighbor and to people around you. But what the Al Qaeda did, they brought the opposite knowledge they’ve learn from the Holy Qur’an. 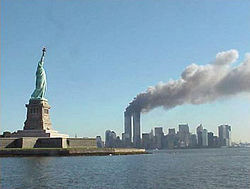 On September 11, 2001, four commercial passenger jet airlines where hijacked by 19 terrorists. They were aiming to strike the Pentagon at Arlington, Virginia, the Twin Towers of the World Trade Center at New York and the Capitol Building or the White House. Instead of hitting the White House, they failed and hit Shanksville in Pennsylvania after the crew and passengers tried to fight with the terrorists. The attacks killed almost 3000 innocent people including the residents, passengers and the 19 hijackers. Hundreds were dead right upon the impact of the jet airlines, others died from being able to inhale some dusts during the collapse of the Twin Towers. Many have died unexpectedly. These unfortunate people are just doing their daily job and at a single snap everything went gone. The family they left behind bear more of the sufferings that incident has brought. Many children lose their mom or their dad, and the pain they undergo is immeasurable. Did the Al Qaeda think about this? Do they consider that there are innocent people whom are not involved will die? Or they are just being selfish, claiming that their ideology is right. How that can be so right when you kill someone, torture people who are not supposed to be anguished. Does the Holy Qur’an impart this kind of wicked teaching? Or just the people who amend themselves that they are right and the other people are wrong. They are not doing this for their religion; instead they’re doing this for their own power and personal destructive ideas to control the world. To get more information about the group of Al Qaeda, visit this page!